Ruby has started the next stage and my heart is in pieces again. The stage started with fasting which is always hard and lots of waiting and finally an operation to test her bone marrow. 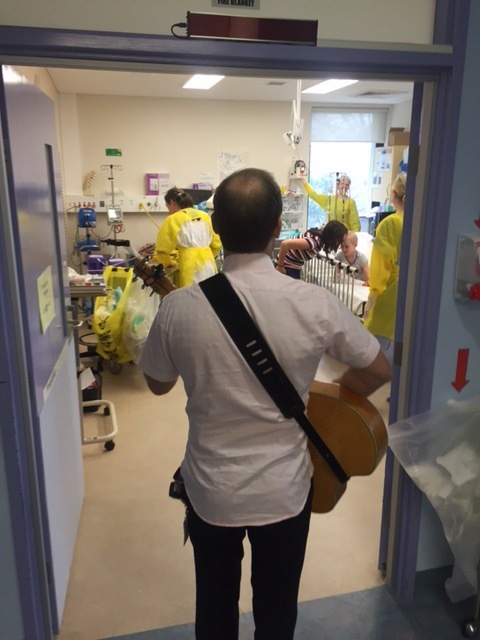 Ruby was serenaded on her way to her operation by Music Matt. A long chat with head oncologist answered all my questions. New drugs. Daily visits to hospital for a Fungal antibiotic. Steroids begin. A drug to prevent lung disease. A drug to prevent stomach ulcers. We are on! Steroids make Ruby massively hungry and angry. She flies into a rage and does not know why. It’s scary but short lived. I hate it but we have 5 weeks of it. Ed said lets adopt the technique that at the end of each day we wipe our memories, recharge and start again. Love that idea. I will be strong. I will protect Ruby as best I can to prevent any other germs and bugs. Her immunity will plummet again. I pray for an easy ride. Please!